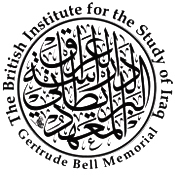 Founded in 1932 as a memorial to Gertrude Bell, The British Institute for the Study of Iraq does not at present have an office in Iraq, but continues to promote the study of Iraq's archaeology from outside its borders; it is currently sponsoring fieldwork in Mesopotamian Syria and in the Gulf. Its publications, including notable series on Nimrud and Abu Salabikh, are distributed by Oxbow. BSAI members receive a 20% discount on all publications - except those already reduced. Please contact us for details. Browse all titles by the British Institute for the Study of Iraq.